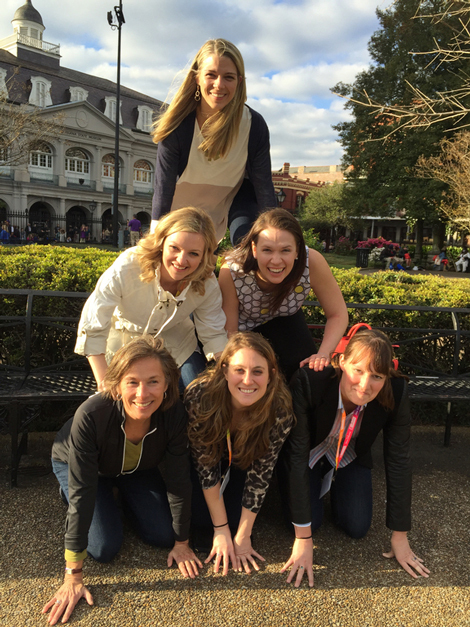 Oldways 6th annual Supermarket Dietitian Symposium, March 20-22, 2016, lived up to all of its expectations in a city known for its food — New Orleans. Made possible through the generous support of Oldways sponsor partners who recognize the value RDN’s add to the retail landscape, the event, hosted at the Ritz Carlton, oﬀered two full days of opportunities for supermarket dietitians and sponsor representatives to share ideas and perspectives. The kick-oﬀ networking reception, held in the charming outdoor courtyard (see above group photo, taken in the courtyard) created a buzz as returning attendees reconnected with their friends and colleagues from years’ past and dietitians new to the retail world gained a ﬁrst-hand appreciation of the important community support available to them. 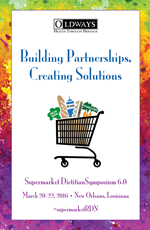 Supermarket dietitian “veterans” from retailers, including Hy-Vee, Wakefern (ShopRite), Delhaize (Hannaford Bros.), Giant Eagle, H-E-B, and Kroger shared “Spotlights” or led discussion groups to showcase programs they have successfully implemented. These programs oﬀer valuable nutrition education services to engage shoppers and provide a new source of revenue and competitive edge. Julie McMillin, RD, LD, the Director of Health and Wellness at Hy-Vee, speaking on behalf of Unilever, shared information on the shift in consumer needs, wants, and purchasing behavior. 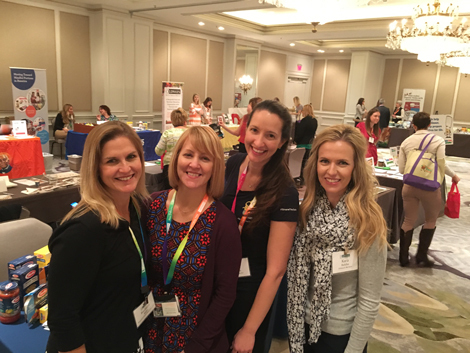 The Kroger Company’s team of dietitians, led by Eileen Myers, MPH, RD, LDN, FAND, shared updates on The Little Clinic, which has plans to expand nutrition services throughout the company, including King Soopers, one of their divisions located in Colorado. 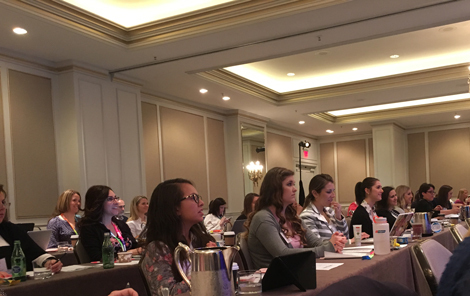 Ellie Wilson, MS, RD, CDN from Price Chopper (NY) shared ideas on how their Family Meals Matter campaign has provided a meaningful platform to connect with consumers. Rita Zapien, MS, RD, LD, CED, an H-E-B regional dietitian located in Houston, TX, shared exciting news about the success of her retailer’s annual “SlimDown Showdown” competition which inspires the community on topics of good nutrition and exercise. In addition to a program chock-full of retail insights, trends, and valuable information to help supermarket dietitians be successful in educating consumers and raising the bar for retail-based health programs, there was no shortage of great food and fun activities. Providing meals that support the Oldways mission - highlighting the unique cultural background of regional food - is an integral part of the program’s success. Although food from the South may conjure thoughts of fried chicken, there is also a rich history of traditional foods that in fact have roots in good health and nutrition. The group enjoyed oﬀ-site dinners at two restaurants run by award-winning chefs: John Besh’s Restaurant August and Donald Link’s private dining room, Calcasieu. There was plenty of local shrimp on the menu, as well as black-eyed peas, okra, collard greens, fried green tomatoes, Cajun and creole ﬂavors, and of course, beignets for dessert. The program concluded with fun and ﬁtness, as attendees spent the afternoon exploring the French Quarter on foot, competing in an iPhone scavenger hunt that brought them face-to-face with the rich history, traditions, and culture of the city. As in years past, attendees left inspired with new ideas and friends as well as many great memories. The 2016 symposium featured 19 presentations. You will ﬁnd copies of some of the speakers’ presentations below. Do keep in mind that speakers add considerable information orally that is not available in the PDFs. And, please note that these works are copyrighted by each speaker and may not be reproduced without the speaker’s written permission.